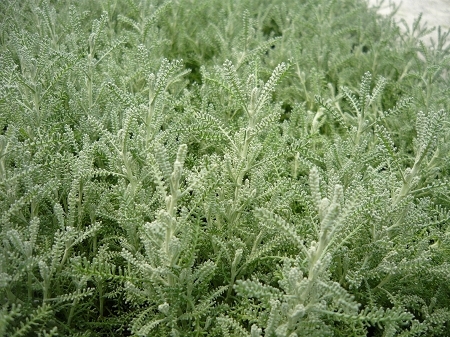 Lavender Cotton (Gray Santolina) - Beautiful herb traditionally used in knot gardens or for a low growing hedge or border. Interesting silver-green leaves are highly aromatic and oils from the plant are used by the perfume industry. Dried flowers are commonly used in wreaths and floral arrangements. Dried material also used in sachets, as it is believed to repel insects such as moths from clothing. Requires sun and well drained soil. Slow growing perennial zones 6-8. Live plant in 3 inch container. My Santolinas arrived very well packaged, and they looked very healthy!!! They have been planted, and they seem to be looking great! Thank you for the quick shipping! ordered on Sunday arrived on Tuesday all plants packaged well and looking beautiful.